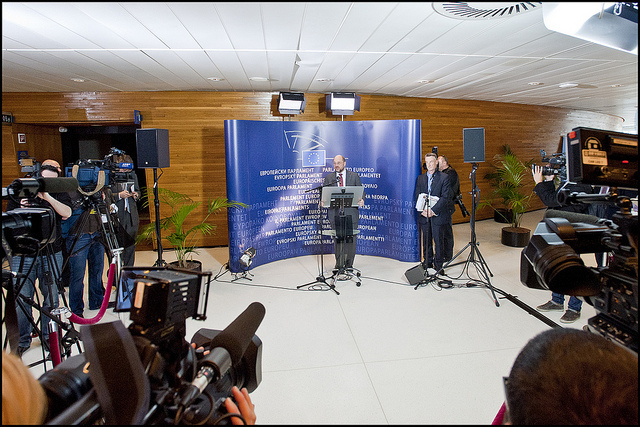 Multi-annual financial framework negotiations, the EP resists and prepares for a fight! We are now entering the final stage of the MFF 2014-2020 negotiations. The long-term budget, which determines EU expenditure for the next seven years, broken down by policy area, may be adopted by the end of this year if the European Parliament gives its consent to the Council’s position. The process started in 2011 and has already gone through a long preparatory phase as well as tough negotiations between Member States. After the European Council of the 7th and 8th February, the Member States have finally struck a deal for €960 billion long-term budget (€908 billion for payment appropriation), that is to say 1.00% of EU’s gross national income. This represents an important decrease compared to the Commission’s proposal and even Herman van Rompuy’s proposal of last November. Institutional “battles” usually take place in budgetary negotiations. The Council tries to lower down the figures while the Commission and EP stand for higher ones (e.g. the in extremis 2013 budget deal). It is no wonder that the struggle is even tougher in time of crisis, when austerity is the catchphrase. Member States try to push for cuts in the EU budget to reflect the national situation and to look good in the eyes of their electorate. What are the EP’s claims? The EP also wants a stronger emphasis on supporting competitiveness, and economic growth rather than a budget spent on ‘priorities of the past’, e.g. taking funds from the agriculture budget, putting them in science and innovation.” MEPs are also extremely worried about the payment shortfall in 2012 which is still not solved. Besides, they consider that the MFF, as it is outlined in the European Council’s deal, would increase the gap between commitments and payments appropriations which could possibly cause a deficit in the coming period. What will happen if there is no consent? It is clear that there is a patient opposition of MEPs against the European Council’s position and this will lead to further negotiations to finally adopt the regulation laying down the MFF.75 Sectorial specific acts, which are also part of the MFF legislative package, are also negotiated in parallel and must be voted under ordinary legislative procedure. Through lack of new MFF, these acts cannot be adopted either. If no agreement is reached by the end of 2013, the 2013 ceilings and other instruments could be extended to 2014, with a 2% inflation adjustment, until a new MFF is adopted. Regarding the resources, such a budget would involve larger spending than the current MFF, but a lower level of funding for certain headings, e.g. heading 1a, or new programmes such as the Connecting Europe Facility would not be covered, while there would be higher ceilings for the CAP and Cohesion Policy. This would not be an ideal situation but it would not ultimately threaten the functioning of the EU. MEP Philippe Lamberts considers it might be preferable for democracy not to have a MFF and to wait until the 2014 elections where parties could stimulate a European-wide public debate on EU priorities. Moreover, it is undeniable that agreeing on a long-term budget representing only 1% of EU GNI is not giving the EU the means to fulfill its ambitions. It remains to be seen how the EP will manage the informal negotiations and whether it will stand for its positions or clash completely with the European Council. 3 European Parliament resolution on the European Council conclusions of 7/8 February concerning the Multiannual Financial Framework of 13 March 2013; http://www.europarl.europa.eu/sides/getDoc.do?pubRef=-//EP//TEXT+MOTION+B7-2013-0129+0+DOC+XML+V0//EN – 506 votes to 161, 23 abstentions. NextToday in Euronews: Gremlins 3! Cyprus trip!